Being able to increase airflow means you can use a smaller diameter port. Since the port length is proportional to the square of the port diameter, this can make a large difference to the length of your ports. A shorter port is more likely to fit into your enclosure without any bends, further saving on noise and build difficulty. It also has less chance of "pipe mode" resonance intruding on the operating range of your subwoofer. The reduction in volume occupied by the port also means a smaller box. Whilst making the moulds requires some work, this can be offset if you make ports for a few friends. For countries where commercial 30mm radius flares are not available, or are too expensive to import, this method can give a professional finish if you take your time. Flares larger than those described above need to be individually built. I've built ports using an "inside out" version of the "heat moulded" technique. A flared port shares part of the air in the flare with the surrounding air, meaning that the port appears shorter. The generally accepted adjustment is to subtract half the flare radius from the physical length to obtain the effective length. If both ends of the port are flared, the adjustment is done for each flare. How large a flare is needed? The results have been incorporated into the "flare-it" downloadable calculator. It is suitable for designing flares for ports up to 150mm (6 inches) in diameter, and which operate with a velocity peak below about 35hz. The following pair of tables show the default recommendations for some common port / flare combinations. Selecting different options, such as allowing some port compression can change these values. As a general rule, the minimum port diameters should be as shown below. Always check the velocity in your design. For high excursion drivers you may need more portage. 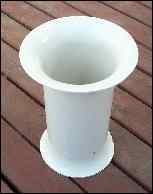 Where possible there should be no wall closer to the port intake than one port diameter. 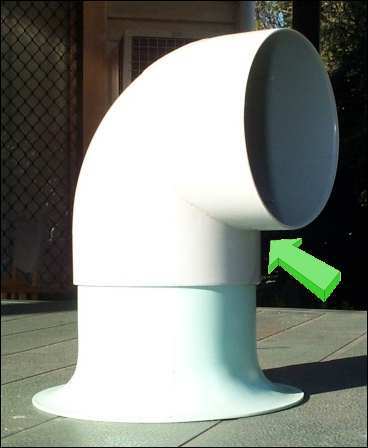 When using a flared port, the ideal clearance should be the diameter of the flare exit. Where this is not possible, aim for one port diameter clearance from the outside edge of the flare. If your port is a bit closer to the back of the box, maintaining plenty of clearance around the sides of the port exit will minimise possible turbulence and tuning changes. Not all bends are created equal. 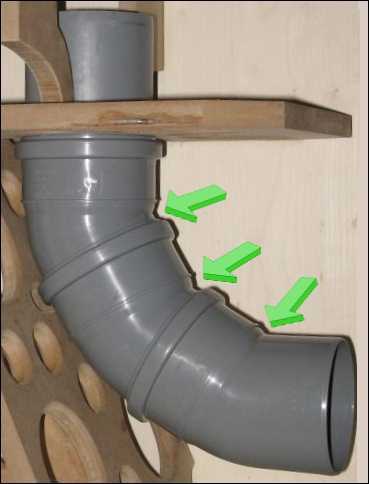 A good bend has a gentle turn, and introduces no sharp edges to the airflow. 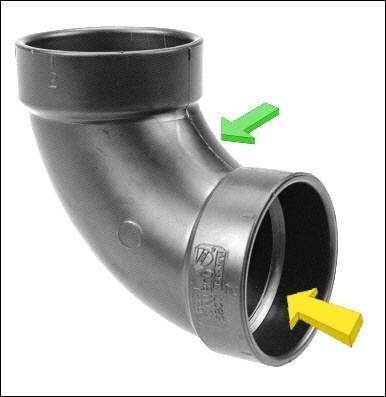 If you are purchasing PVC elbows, bear in mind that one of the papers on the AES site recommends that the minimum bend radius should be 20% of the port diameter. If your supplier only sells bends where the inside bend is a sharp 90 degree step, try and find an alternate source. Port flares allow a controlled change in velocity as air exits a port. 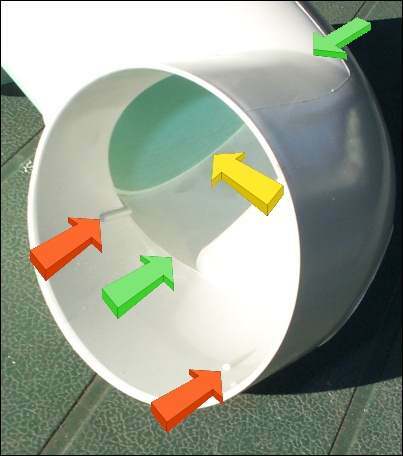 This can prevent turbulence in the boundary layer, close to the port wall, from becoming audible. As the airspeed is lifted a little further, turbulence within the straight section of the port becomes an issue. The reason a ported speaker works is because the air in the port causes a 180 degree phase shift in the air behind the driver. When the air comes out of the port, at least at the tuning frequency, it is in-phase with the front of the driver, giving a boost to the output. Eventually the port acts as a mere hole in the box, short circuiting the acoustic output of the driver and allowing excursion to become uncontrolled. The compression of an unflared port worsens in a steady curve. A flared port "hangs on" for longer, and then quickly plummets. Ultimately both ports fail at the same level which represents completely turbulent flow throughout the port. Much like a car racer using slick tyres, the trick is to use the extended capability of a flared port whilst making sure it's not pushed to the point where it "lets go"
Factors which come into play include air velocity, port diameter, port length and port flare radius.